I have had the best day. I am on the mend from my sinus operation feeling much better today and just as well as I spent the day with the other “Groovy Goddesses” at the “Lifestyle and Wellness Expo”. Today was our first venture as the “Groovy Goddesses” which are Michelle doing Angel Readings, Deb doing Reiki, Carol with her handmade Candles, Maria being our Manager of sorts and me with my jewellery. The Expo wasn’t hugely busy, but it was a great experience day for our first. There were some interesting stands there with readings being performed, aura photos being taken, Henna tattoos being magnificently drawn – I actually got one – people indulging in relaxing massages and generally lots of people with the same interests having a lovely relaxing day. You never know today could be the start of more enjoyable days for the “Groovy Goddesses”. Fabulous photo, Davine! :) We had such a GREAT day! I enJOYed it immensely. 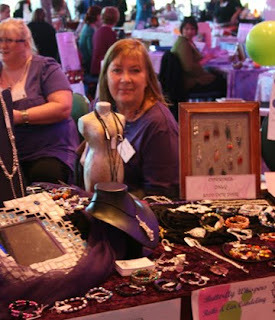 And, I loved being able to indulge in your gorgeous jewellery - in person! Here's to many more fabulous Groovy Goddess Events!! Awesome to hear that you're on the mend and sounds like you had a ton of fun, good for you! That's awesome to call it Groovy Goodness, I love that name!